I am back for a second cup of “Coffee & Cream” GC challenge no 88. I could not resist making another card using the same theme. This card goes to my dear sweet friend in Breckenridge MN. 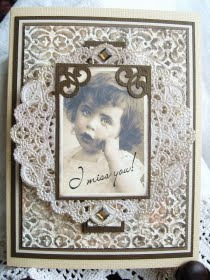 I do miss “Miss Lena Lue”, and all our stamping and scrapbook days. For this card the graphic is from “Magic Moonlight”, stamp is from Stamping Sensations. I stained a paper doily with ink and gold leafing pen, and added two Basic Grey bling it gems. Miss Lena Lue is so going to love this beautiful card! Just gorgeous, Vada! Warm hugs! 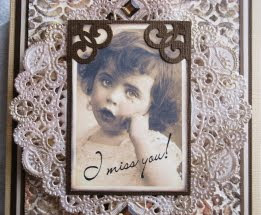 OH MY another gorgeous Coffee and cream card, Your friend is going to love it and no doubt she misses you just as much as you miss her.